In 2017 , the global accumulative electric vehicles sales has exceeded 2 million units, with the growth remain to expanding in the major electric vehicles market of China, Europe and United States. Plug-in electric vehicles have created a significant space in United States electric vehicles market with around 45% market share. Additionally, there are about more than 17 plug-in hybrid electric cars model in the U.S electric vehicles market provided by the ten different manufacturers. One of the major growth drivers in United States plug-in hybrid electric vehicle market is effective policy support from state and local governments. Government in United States is providing various monetary and non-monetary supports to the electric vehicle customers in order to support mass adoption of EVs. On the other hand, electric vehicle’s battery manufacturers aggressively working to develop cost effective batteries that have put electric vehicles on track to pass conventional vehicles. Indeed, U.S. electric vehicles sales have grown on an average of 32% annually from 2012-2016 and 40% over the year ending June 2017, the plug-in hybrid electric vehicles sales are set grow in coming years also. 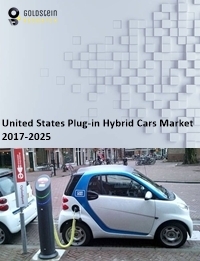 The report covers the present ground scenario and the future growth prospects of the United States Plug-in Hybrid Cars Market for 2017-2025 along with the market players’ analysis. We calculated the market size and revenue share on the basis of revenue generated from major players in all major regions. United States Plug-in Hybrid Cars market is forecasted on the basis of revenue analysis, product benchmarking and strategic developments of key market players. United States Plug-in Hybrid Cars Market Outlook 2017-2025, has been prepared based on an in-depth market analysis from industry experts. The report covers the competitive landscape and current position of major players in the U.S Plug-in Hybrid Cars Market space. The report also includes porter’s five force model, SWOT analysis, company profiling, business strategies of market players and their business models. “United States Plug-in Hybrid Cars Market Report” also recognizes value chain analysis to understand the cost differentiation, pricing models to provide competitive advantage to the existing and new entry players. Our U.S Plug-in Hybrid Cars Market Report comprises of the following companies as the key players: Daimler AG, General Motors Corporation, Toyota Motor Corporation, Mitsubishi Motors Corporation, BYD Auto Co. Ltd., Volkswagen AG, BMW AG, Honda Motor Co. Ltd., and Hyundai Motor Company.